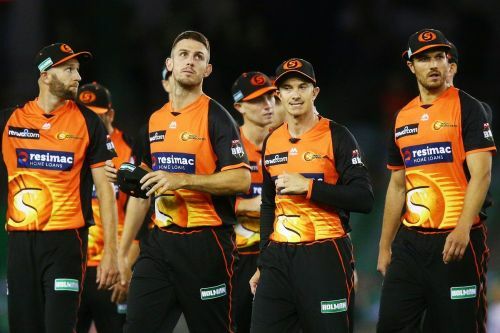 After facing defeats in their first two games, Perth Scorchers will be hoping to secure their first win of the season when they lock horns with Adelaide Strikers on Wednesday, 26 December 26 in Perth. These two teams have played each other in 12 BBL games, with the Scorchers winning seven and the Strikers five. In their previous face-off, during BBL07, the Scorchers managed to pip the Strikers by four wickets. Batting first, the Strikers scored 137/6, thanks to a steady 56 from 43 balls by Jake Weatherald. But his effort was overshadowed by Cameron Bancroft and Adam Voges' 77-run fifth wicket partnership, and the Scorchers overhauled the target with three balls to spare. The Scorchers have now lost their last two matches in the BBL and they are finding it extremely difficult to break the duck. But they will take some confidence from their previous record against the Strikers, and will look to come out all guns blazing in a bid to open their account on the points table. The Scorchers were let down by their batsmen in both matches. They got skittled out for just 103 against the Melbourne Renegades and then failed to chase the Sydney Sixers' total of 164. Ashton Turner and Hilton Cartwright are the key men in the batting line-up. The two batsmen are the leading run-getters for the side this season, with 62 and 65 runs respectively. Michel Klinger scored a watchful 28 from 32 balls in first game against Melbourne, and these three will be expected to make a sizable contribution in the next fixture. In this department, the team will look to their frontline bowlers Jason Behrendorff, Nathan Coulter-Nile and Andrew Tye to deliver the goods. Behrendorff has taken two wickets in each of the two matches so far, and Coulter-Nile also took two against Melbourne Renegades. Tye is yet to make a mark in this season and the pacer will be eager to make it count against the Strikers. David Willey, Ashton Turner, Hilton Cartwright, Ashton Agar, William Bosisto, Nathan Coulter-Nile, Jhye Richardson, Andrew Tye, Jason Behrendorff, Sam Whiteman and Michael Klinger. 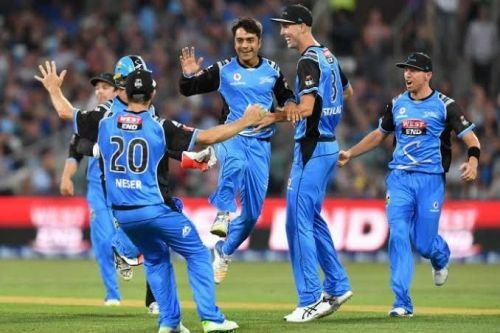 The Strikers started off their BBL campaign with a dominant performance against Brisbane Heat, but lost their way a bit against Melbourne Renegades, who overhauled their target of 175 with five wickets in hand. Matthew Short is looking in terrific touch with scores of 13 and 65 in the first two games respectively, and he looks set for another big knock here. Meanwhile, Jonathan Wells with respective scores of 24 and 42 in the previous two outings, also looked fluent in his strokes and can be expected him to produce a quality innings. Alex Carrey announced his comeback with an entertaining 70 runs from 46 balls in the opening fixture against Brisbane Heat. Skipper Colin Ingram is the only player who has not been able to perform in this series so far, and will be hoping for a turnaround in next fixture. The Strikers' main bowler Rashid Khan has taken the most wickets; five in two matches, and he was the pick of the lot last time with figures of 2/13. Billy Stanlake and Matthew Short have also been impressive with four and two wickets respectively, and the team will need them to pick a few scalps upfront. Colin Ingram (C), Alex Carey, Jake Weatherald, Matthew Short, Jonathan Wells, Jake Lehmann, Michael Neser, Rashid Khan, Cameron Valente, Ben Laughlin and Billy Stanlake.